UNI EN 1264-5:2009 the new part introduced to provide a means of calculating the thermal output of wall and ceiling heating surfaces, and the heat removal capacity of wall, ceiling and floor cooling systems. It is the part of the standard that helps to calculate the output of radiant wall and ceiling systems operating in heating and/or cooling mode and the output of radiant floor systems operating in cooling mode. The recalculation method described in this part of the standard enables the conversion of the calculations and test results of UNI EN 1264-2. 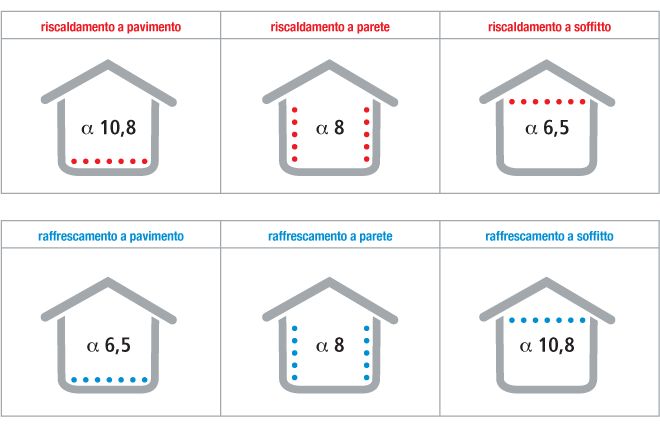 The output factors KH, calculated for the system assumed to be operating as underfloor heating, are corrected with algorithm (1) of Paragraph § 4 in order to take into account heat transfer conditions between different heating/cooling surfaces and ambient air. Radiant ceiling systems that are not integrated into the ceiling structure are not subject to UNI EN 1264. Work is currently being done to revise UNI EN 14037 (prEN 14037:2011) which, in the 2005 version, covers radiant heating strips. The objective is to make UNI EN 14037 the reference standard for calculating values for heating and cooling systems installed in ceilings but not integrated into the structure.